Henri Rousseau, known as "Le Douanier" after his career as a toll collector for the city of Paris, is the most famous exponent of Outsider Art, that is, paintings produced 'outside' the established art world. He began teaching himself how to paint from the age of 40. Within two years he was a regular exhibitor at the annual Salon des Independants in Paris, and at the age of 49 he took early retirement to become a full-time painter. Innocent and unsophisticated, Rousseau developed his own unique style of modern art - a surrealistic blend of primitivism and pure fantasy - best known for its imaginary jungle scenes such as The Dream (1910, MOMA) and The Snake Charmer (1907, Musee d'Orsay, Paris). Impervious to influence from other artists and unburdened by any knowledge of perspective or anatomy, Rousseau's primitivism was characterized nonetheless by vivid colour, great attention to detail, a wonderful imagination and a sparkling freshness no matter how large or detailed the canvas. Now regarded as an artist of considerable, if uneven, achievement, he was capable of producing paintings of great humour as well as spiritual beauty. First 'discovered' about 1906 by the German art collector Wilhelm Uhde (1874-1947), he was greatly admired by Guillaume Apollinaire (1880-1918) and a number of modern artists including Pablo Picasso (1881-1973) and Robert Delaunay (1885-1941) - whose mother commissioned Rousseau to paint The Snake Charmer - although ultimately he died in poverty. The picture depicts a wandering black-skinned woman who lies fast asleep beneath a moonlit starry sky. By her side is her mandolin and a pitcher of water. As she lies there, a lion (who has presumably followed her scent) appears to be watching over her with no obvious predatory intent. The pale colour of the moonlight is offset by the woman's multi-coloured striped costume and blanket, all of which adds to the surrealist dream-like quality of the scene. Ordinarily, such a painting would automatically be attributed to the Symbolism painting movement, but Rousseau was too uncomplicated and detached from art theory to be associated with any movement. He was only interested in creating decorative, escapist pictures, which he worked up very slowly using numerous layers of paint. He obtained many of his images from popular magazines, happily mixing different habitats and cultures, and showed no desire to learn the finer points of anatomy, proportions or perspective. In this case, the lion looks suspiciously like a sheep; the body of the woman is tilted forwards in a non-naturalistic pose, as though seen from above; and the gypsy's Italian mandolin contrasts with her oriental striped costume. But Outsider art is entirely unconnected with cultural norms, which therefore must not be applied to it. Instead The Sleeping Gypsy should be viewed merely as a poetic, dream-like image - which, interestingly, (like all Rousseau's works) is beautifully finished, with the paint left perfectly smooth, and unified by a top coat of varnish, in the best traditions of the French Academy! Nonetheless, one can't help but admire the imagination of this self-proclaimed 'Sunday Painter', not the least because the flattened forms, decorative colours and use of a mandolin, in Sleeping Gypsy are highly reminiscent of the Synthetic Cubism style of painting, which came into vogue 20 years later. 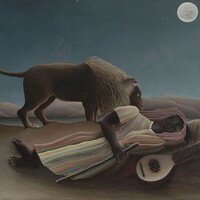 Furthermore, the strange assembly and juxtaposition of gypsy, oriental costume, lion, mandolin and moonlight is a wonderful example of Surrealism, whether or not it was so intended. In addition, it seems clear that - in his escapism, his inspiration from dreams, his reduction of a picture to a decorative surface - Rousseau is connected with the idiom of Paul Gauguin (1848-1903). The painting was first shown at the 13th Salon des Independants, after which it was bought by a Parisian charcoal merchant, in whose collection it remained until 1924, when it was 'discovered' by the art critic Louis Vauxcelles (1870-1943). Vauxcelles was familiar with Rousseau's work from the 1905 Salon d'Automne when a large Rousseau jungle painting displayed near Matisse's notorious work Woman with a Hat is said to have prompted the critic to christen Matisse's group "Les Fauves" (wild beasts). In 1924, The Sleeping Gypsy was bought by Picasso's former dealer, the German-born Daniel-Henry Kahnweiler (1884-1979) after which it was acquired by art historian Alfred H. Barr Jr. for the Museum of Modern Art in New York.  Portrait of Madame X/ Madame Pierre Gautreau (1884) by Singer Sargent.  The Large Bathers (1894-1906) by Cezanne.  Boulevard Montmartre (1897-8) by Pissarro.  Water Lilies (Nymphéas) (1897-1926) by Monet.  For analysis of other examples of primitivist 'outsider art', see: Homepage.